The Firehouse 12 Spring Concerts Series presents Barry Althscul & the 3Dom Factor this Friday May 23 for 2 sets - 8:30 and 10 p.m. The 71-year old drummer/composer Altschul, a native of New York City, has been an important presence on the creative music since the late 1960s. He first came to critical attention playing with pianist Paul Bley before hooking up with Chick Corea and bassist Dave Holland. With the addition of Anthony Braxton, the quartet recorded as Circle. They recorded a 2-Lp set for ECM that remains one of the finest documents of the "avant-garde." He worked and recorded with Professor Braxton during the 1970s, recorded several Lps for Muse, played with Sam Rivers and ended the decade with a splendid trio that featured trombonist Ray Anderson and bassist Mark Helias that recorded one great album under the name Brahma for Sackville Records. Altschul then moved to Europe for the next 2+ decades working steadily but not recording as much. In the mid-2000s, he began to work with violinist Billy Bang and bassist Joe Fonda, recording first for CIMP Records and then going on to release 4 more disks before Bang passed from cancer in 2011. In early 2013, TUM Records released 3Dom Factor, a trio led by Altschul with his friend Fonda plus alto saxophonist Jon Irabagon, with whom the drummer had recorded the high-energy "Foxy" in 2011. The group's interactions, the drummer's rhythm-laden compositions and the great sound made the CD a favorite for many critics and listeners. Fonda's melodic and elastic bass lines, Irabagon's forceful, bluesy, and athletic sax playing, all blends smartly with the drummer's intelligent style. For ticket information, go to firehouse12.com or call 203-785-0468. To learn more about Barry Altschul, read this excellent interview with Harris Eisenstadt posted on the Destination-Out website: destination-out.com/?p=4213. 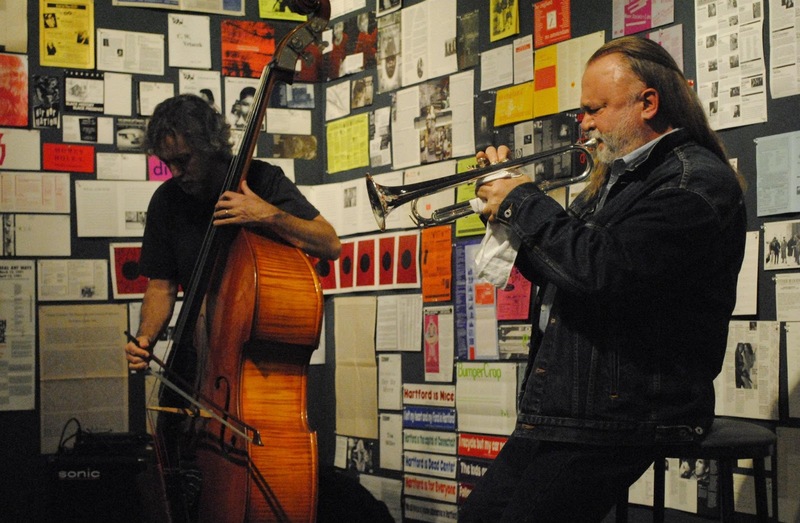 The 3rd season of "Improvisations", the monthly series at Real Art Ways in Hartford curated by Stephen Haynes and Joe Morris, comes to a close - actually more like a climax - this Saturday (5/24) with "Spectacle", an event that brings together improvising musicians from the Tri-State area (CT, NY, MA). In the words of Messrs. Haynes and Morris, the assembled multitude will perform in a "series of ad hoc groupings of various sizes...culminating with all the players performing in the large ensemble, Abstract Forest." The event takes place from 6 - 11 p.m. and will feature Taylor Ho Bynum (cornet), Jerome Deupree (drums), Tatsuya Nakatani (percussion), Daniel Levin (cello), Chris Cretella (guitar), Mat Manieri (viola), Jim Hobbs (alto saxophone), Brad Barrett (bass), Minta White (flute), Matt Plummer (trombone), Andria Nicademou (vibraphone), Daniel Pencer (tenor sax, clarinet), Zoe Christiansen (clarinet), Matt Chilton (reeds) and Sean Sonderagger (reeds) plus Haynes (cornets) and Morris (guitar, bass). With all these fine musicians, one expects the evening to filled with sounds and surprises. For more information, go to www.realartways.org/livearts.htm#Spectacle. Busy 3-day weekend at The Side Door Jazz Club in Old Lyme - the fun and the funk starts on Thursday with alto saxophonist Donald Harrison (pictured left) and the Berklee Quartet. New Orleans native Harrison will perform alongside students from the music school in Boston, MA including Santiago Bosch (piano), Osmar Okuma (bass) and fellow Crescent City native Darryl Staves (drums). On Friday, Danish saxophonist Benjamin Kopell returns to The Side Door with an all-star Quartet that includes the great French pianist Jean-Michel Pilc, bassist Johannes Weidenmuller and drummer John Hadfield. Kopell, who appeared in Old Lyme last year in a duo setting with pianist Kenny Werner, has just recorded a new CD with Pilc, "Illuminations", based on the work of French poet Arthur Rimbaud. This should be quite a night of melodic and rhythmic adventures. The weekend concludes with vocalist/saxophonist Greg Piccolo & Heavy Juice. Piccolo, a mainstay of the East Coast Blues, Jazz and R'n'B scenes, spent a quarter century with Roomful of Blues but has been leading Heavy Juice since 1994. After years of touring, Piccolo has stayed close to home for the past several years so it's a real treat to see him live and alive again. Doors at The Side Door open at 7:30 p.m. with the first set commencing at 8:30. For more information, go to thesidedoorjazz.com or call them at 860-434-0886. Upcoming shows include the Jeremy Pelt Quintet (5/30), Etienne Charles Group (5/31), Diane Schur (6/11), Sunna Gunnlaugs Trio featuring Scott McLemore (6/20) and much more. Looks like quite an exciting Summer on the CT shoreline. On Friday, pianist-vocalist Orice Jenkins, Hartford native, brings his Trio to The Buttonwood Tree in Middletown for an 8 p.m. show. Joining him in the performance space will be guitarist Dan Liparini and bassist Tom Sullivan. Jenkins' music covers a large territory, from classic jazz to r'n'b to soul and beyond. For more information, go to www.buttonwood.org. To learn more about Orice Jenkins, go to oricejenkins.webs.com.